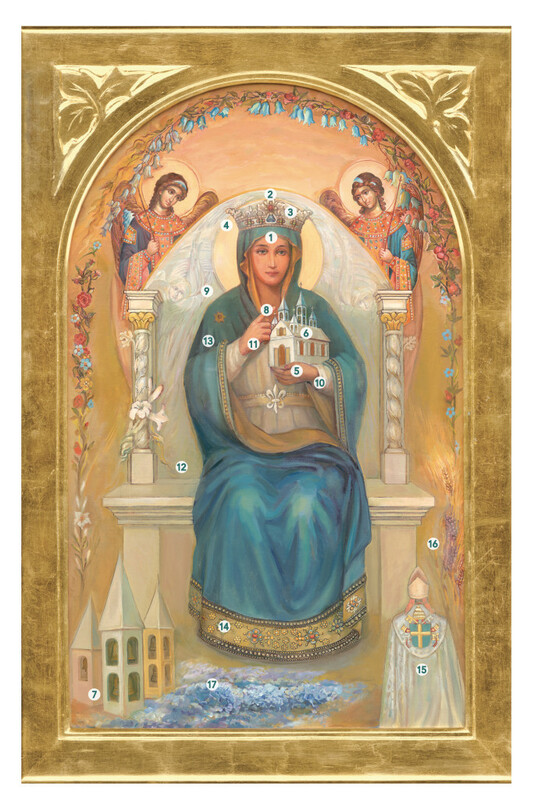 We have the great joy and privilege of welcoming the image of Our Lady Queen of the Church. On her silver crown there is a large blue stone, the most prominent. This represents her maternity, both human and through her human maternity to Jesus, divine. She was a human mother who nourished a little baby and she is a spiritual mother who nourishes all of God’s children. On each side of the blue stone we see two emerald green stones which represent the four vocations in the Church, namely married, single, religious and clergy. The stones are of equal size and value to the Queen because each vocation is necessary for her to complete her task of the renewal of the whole Church on earth. The stones in Our Lady’s crown signify how she contributed to the Church in her life. The green stones signify how we contribute to the Church on our life. Co-responsibility must be accepted by every person in each vocation because each vocation must play a unique part in the advancement of the Church into its final preparation as the Bride of Christ. Our Lady’s left hand supports the Church, a humble, simple building. The doors are open, the windows also. There is transparency, and, we pray, humility. When I say Church, please do not think of only clergy. WE are ALL the Church. We need to be transparent about our beliefs and also our imperfection and our journey. The whole Church, in order to represent Jesus Christ accurately, needs more humility. All of us. Our Lady will help us with this and prompt us gently toward very humble service to the people around us. The many bells on the roof represent the Church in every country. I saw, in a vision, on top of the Church, a bell for every country. Each was meant to ring out a distinct harmonious note. I saw that there were weeds coming up through the inside of the Church and they were interfering with the movement and function of the bells in various countries. In other countries the bell was ringing functionally and sounding the right note, meaning, the Church in that country was accurately representing heaven. In other countries, the Church was being misrepresented and therefore people could not see the beauty of our faith. Overall, the bells were not sounding together and creating the type of harmony that the Lord wants. I saw that it was Our Lady’s role to bring the bells into harmony, meaning, to restore and renew the Church in each country and to bring about consistency. Now, consistency does not mean conformity. You can see in the lower left foreground that there are three sets of bells. These represent the Church in different countries and the colors are notably different. The subtle difference in the colors indicates the unique personality of the Church in each country. This is good. The Church in each country must transform into its highest representation of Church. We must contemplate ourselves as Catholics and also nationally so that we can express our unique selves in the international Church. The Irish Church will look a little different than the African Church and the Chinese Church will hold its beautiful Chinese expression and still function in the same way as the American Church only singing out a little differently. We have a great deal, always, to learn from each other. We see Our Lady indicating the bells on the top of the Church. It is her project to renew the Church in each country and she must be known in each country individually as the Queen of that country. Our Lord holds the scepter of Kingship in the image of Jesus Christ the Returning King. Our Lady, through her humanity, offers us the truth that the Church on earth is incarnational and meant to be presented and represented daily through our human representation modeled after her spotless call. The fact that we imperfectly represent God’s perfection should not deter us from a spirited preaching of the Gospel message. Our Lady, the Queen of the Church is issuing an invitation to all Catholics to return to the Sacramental life of the Church. The church is held in the hand of Mary, near her heart and offered to the world from the hand of a woman so that we can see that women are essential to the life and growth of the Church and impact profoundly how the Church is both presented to the world and viewed by the world. The Queen of the Church is inviting all women to emulate her strength and humility and she is asking men to protect and promote the role of women, in the Church, yes, and also in the world and, of infinite importance, in the family. We must advance together in unity or we will not advance. Our Lady’s beautiful hands represent her humanity and the teaching of the Assumption that she was brought into heaven both body and soul. She sits on a silver throne, different to the Lord’s. This emphasizes that she is separate from the Trinity, a created human being, simultaneously subordinate to God and elevated by God. While God created her immaculately for her role as the first tabernacle, Mary contributed an ongoing yes answer and made a choice to remain immaculate. In doing so, she enclosed herself in the divine will, which is represented in the closure of the clasp of her belt with the silver fleur de lis, symbolizing the Trinity. Her whole humanity and life were enclosed in service to the Church on earth. Indeed, Mary is a living symbol of obedience and models for us the same call of obedience to the teachings and leadership of the Magisterium of the Church. She is directing us all to this obedience in a special way in this time. The diocesan structure of the Church is represented by the intricate and rich hem of her garment which encircles her mantle, just as the Church encircles the earth. On the lower right side is an image of the Holy Father kneeling before Mary as Queen of the Church. On the back of his vestment are the keys to the kingdom representing the ongoing papal role and asking that each pope seek guidance and protection from the Queen. We see the wheat and grapes in the border, representing the Eucharist. Lastly, we have the beautiful flowers at her feet, representing what Saint Pope John Paul II called the new springtime. In the end, Our Lady, Queen of the Church, will bring about harmony, consistency and renewal in the Church throughout the world. Who, like Mary, can draw God’s children back into purity as a reciprocal gift of love to the Father? Who, like Mary, can properly model the necessary strength and humility of women as they live out their commitments to Jesus Christ our King? Now, the diocesan structure of the Church is very important in this time. For renewal to take place quickly, it will have to happen more or less simultaneously in every diocese around the world. This is why lay apostles are urged to pray for their bishop and be part of their diocese in some way. Our children must know which diocese they come from and understand that they are part of something from heaven, here on earth. Mary, our Mother, has many titles. One of them is Mother of the Church. In this beautiful reference we see that maternity and protection come from Our Lady as she ministers to the Body of Christ serving on earth. In this time, the Church is challenged to move into a dynamic period of renewal. Renewal will require each Catholic to attach himself to the ever present power of the Holy Spirit and allow God to draw from him graces of love and evangelization. Only an active and co-responsible laity can insure swift advance in this regard. This change is necessary if the Church is to respond positively and decisively to the confusion experienced by God’s children in the face of both subtle and direct challenges to our Way. While, as Catholics, we seek to obtain and to retain the freedom to practice our faith, we must also consider that we believe Christianity has the obligation in the world to represent God’s highest hopes for the dignity of humanity. This is a serious obligation. For this reason and this purpose, it would seem that the Lord desires that His most holy mother became known as Our Lady, Queen of the Church. Venerated in this way, she will intercede with specific graces for the protection and growth of the Church on earth. The Church will benefit through Mary’s dignity as Queen of the Church, but also through her influence and authority as Queen of the Church. Honoring the feminine authority of Mary as Queen will provide for all Catholics a spotless call, drawing them further into service in the Church, not as passive participants but as meaningful and active contributors who, like Mary, can help protect the course of all of humanity by humble service to the King’s wishes through fidelity to the Magisterium. Our Lady, Queen of Apostles, Queen of Saints, Queen of Angels, Queen of Peace and Queen of Heaven and Earth is already, by virtue of being the mother of the King, a Queen. Chosen by the Creator to remain immaculate, she chose never to be separated from the will of the Trinity and it is for this reason that she should be venerated as Queen of the Church. Mary, mother of the King, can be an approachable first stop for those seeking reconciliation with the Sacramental life of the Church and her intercession as Queen of the Church during this period will restore many to the Sacraments. There are those who express a feminine wound in the Church. Certainly, the times prompt equality and dignity between men and women. In heaven there is most assuredly this equality and dignity which we desire on earth but imperfectly strive to achieve. By offering the truth about Mary’s role in the Church, that is, acknowledging her Queenship therein, we will help to heal people from a wound and direct them to a model. We will more brightly illuminate an existing path. By venerating Mary as Queen of the Church, we will allow God to teach us more about the complementarity of the genders. It is hoped that the woman entering service to the Church will view herself, like Mary, as essential to the life and growth of the Church. The woman entering service to the Church will recognize the beauty of complementarity as essential, and not incidental, to the spread of the Gospel Message. It is hoped that the man entering service to the Church will view himself as a bold proclaimer of Jesus Christ in the world as well as in the Church, and as someone who acts with Jesus to protect and defend Mary, the Queen of the Church. The man entering service to the Church will recognize and defend the essential role of women, not only in the Church but also in the world and, so preciously, in the family. 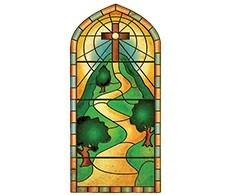 Clearly, God reveals Himself and His plan for the Church into the Church over time. The preparation of the Bride of Christ advances and into each time God sends the remedies and protection for all challenges to the proper development of the Church. We, as Catholics, must be alert to the Spirit who seeks to both defend and advance in that we simultaneously protect what is truth and advance further into that truth. In other words, further development in the present of that which we have received in the past is no threat, and indeed, only verifies the true nature of our beliefs. Therefore, with confidence in God’s presence in this historical period of time, we respond to what we believe is His desire that Our Lady, Queen of Apostles, Queen of Saints, Queen of Angels, Queen of Peace and Queen of Heaven and Earth also be venerated as Our Lady, Queen of the Church. Introducing Our Lady, as Queen of the Church, who can help us to both order our minds to heaven and also strike the right note in offering God’s love to other. Why do we believe the Lord is calling for the spread of both the title and the image? The times prompt equality and dignity between men and women. In heaven, there is most assuredly this equality and dignity which we desire on earth but have yet to achieve. By offering the truth about Mary’s role in the Church, we will help, hopefully, to heal some people from a wound and direct us all to a model. We know that the Church is developing over time. And we know that Our Lady is very important to us now because we so urgently need renewal in the Church. The images of Jesus Christ the Returning King and Our Lady Queen of the Church may be hung side by side to represent the complementarity of the genders. Our Catechism teaches that in creating man, male and female, God gives men and women an equal personal dignity. He wants this in the Church and out of the Church. Both the feminine and the masculine teach the truth, but often in different ways. We need both.